Successful management has brought the Scandinavian brown bear (Ursus arctos L.) back from the brink of extinction, but as the population grows and expands the probability of bear-human encounters increases. More people express concerns about spending time in the forest, because of the possibility of encountering bears, and acceptance for the bear is decreasing. In this context, reliable information about the bear’s normal behaviour during bear-human encounters is important. Here we describe the behaviour of brown bears when encountering humans on foot. During 2006–2009, we approached 30 adult (21 females, 9 males) GPS-collared bears 169 times during midday, using 1-minute positioning before, during and after the approach. Observer movements were registered with a handheld GPS. The approaches started 8696348 m from the bears, with the wind towards the bear when passing it at approximately 50 m. The bears were detected in 15% of the approaches, and none of the bears displayed any aggressive behaviour. Most bears (80%) left the initial site during the approach, going away from the observers, whereas some remained at the initial site after being approached (20%). Young bears left more often than older bears, possibly due to differences in experience, but the difference between ages decreased during the berry season compared to the pre-berry season. The flight initiation distance was longer for active bears (115694 m) than passive bears (69647 m), and was further affected by horizontal vegetation cover and the bear’s age. 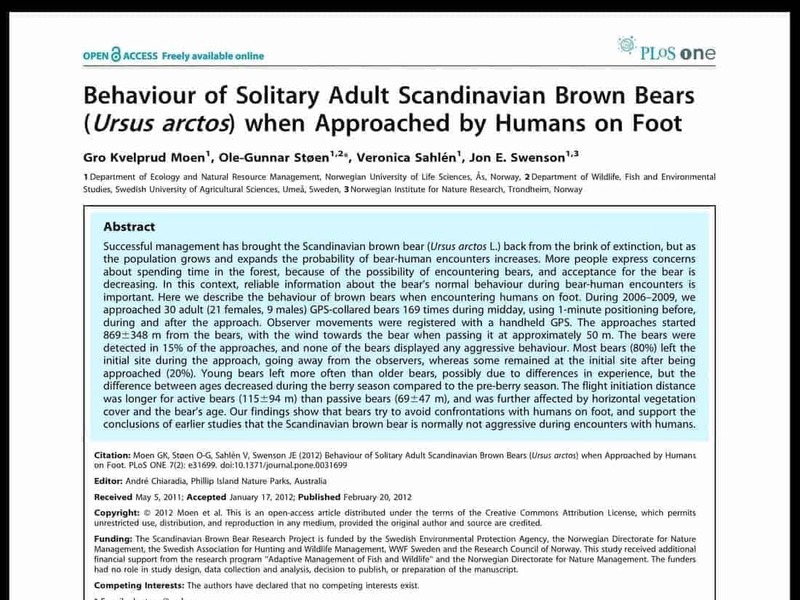 Our findings show that bears try to avoid confrontations with humans on foot, and support the conclusions of earlier studies that the Scandinavian brown bear is normally not aggressive during encounters with humans. Hi Olga, it is a clear sign, that the local authorities have no plan on how to deal with such situations. We will be in the Trentino Thursday and Friday and present alternatives and an Ecosystem ideas on how to improve the bear and human coexistence issue there.